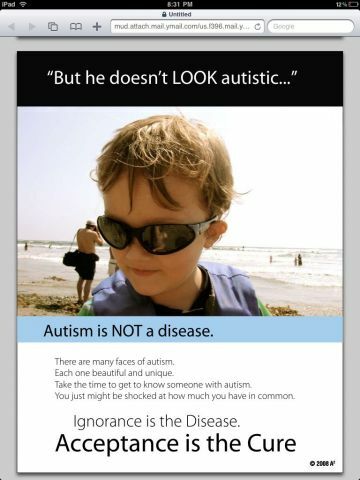 As some of y’all are aware, April is Autism Awareness month. 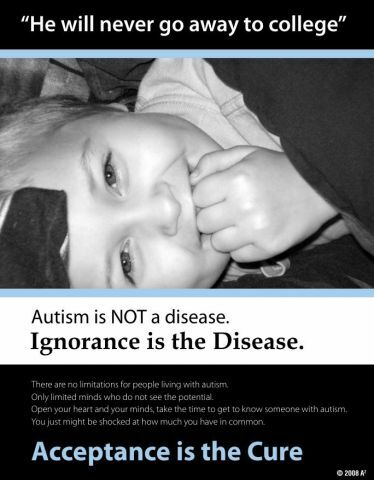 April 2, 2011 is World Autism Day. Autism awareness has come a very, very long way. But there’s a grassroot movement afoot to let everyone know that Awareness is not enough. That’s why Autism Father, Stuart Duncan, created this facebook page. We must also move to accept and understand. 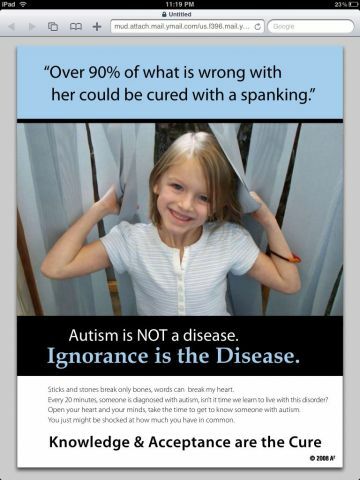 And not just autism. Disabilities. Mental illness. It isn’t enough to just be AWARE of something. It’s necessary to also be accepting and move to a greater level of understanding. 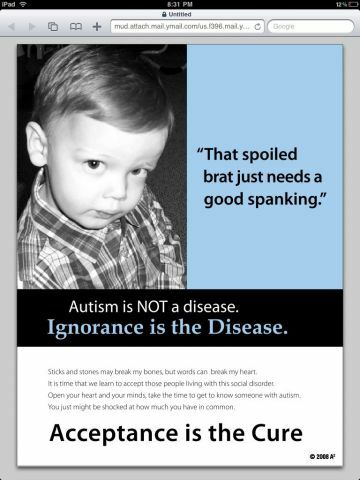 It’s important because it shows you respect our children, not pity them. It’s important because we don’t want people to get the wrong idea. We need them to accept our kids for who they are. Start at that facebook page. Join us on April 2, so we can show you who are kids are. And join us, so we can come together as one community, one voice, united to make sure we are heard. 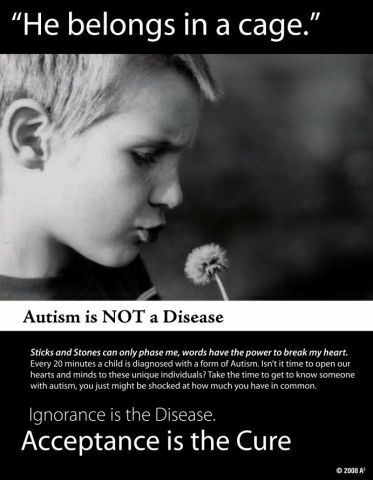 It’s time people know what Autism really is. Wow. Love the campaign photos. It kicks you in the gut. As it should. I know. They are good. Aren’t they gorgeous? Wish they were mine! Excellent post! Another aspect is that we must accept ourselves. Like the cliched sayings that you can’t love others until you love yourself, seeing ourselves — with all of our oddities and quirks and screw-ups — as okay leads us to see everyone else as just fine the way they are. The concept of acceptance, can raise the issue with some folks that the people are giving up on their child, and surrendering to autism. I don’t believe that is what the word means in this article. I think that we accept our children and love them. I also believe that acceptance of their autism, gives us a stepping stone to working with, and helping our children with autism. So of course I love and accept all of who he is as a person, but I must be aware, and accept the fact that he has autism, because if I don’t I am sticking my head in the ground. Acceptance can be an impetus for us to take action and seek help for our children. The concept of acceptance and understanding, as far as Stuart sees it, is for others who don’t have a good knowledge of autism to be more aware, to accept and respect that these individuals have autism and to understand the challenges they face. Of course, it is important for families to accept their loved ones with autism. Not everyone does. You’d think that parents would be the first one to have unconditional love for their children but it doesn’t always work that way. Sometimes parents’ egos and embarrassment and lack of willingness to learn (and selfishness) get in the way. What a great campaign. That last one, with the cage, makes me want to cry. Our kids aren’t animals, though they may be really challenging. I need to put this date in my diary, or someone feel free to remind me. No worries. I’m planning on blogging the hell out of it! Interesting campaign. I review campaigns like this in my graduate work pretty frequently. I’ll have to take some screen shots to share with a few folks.